Jimmy & Jey Uso have been regarded as one of the greatest tag teams in WWE History and they have another accolade to make that argument. 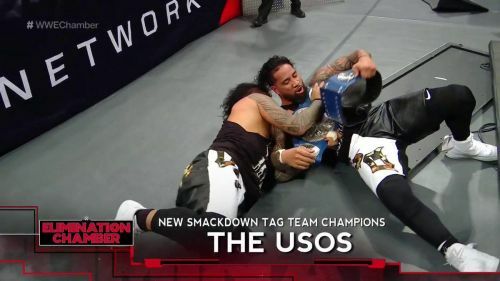 After defeating The Miz and Shane McMahon at the Elimination Chamber, The Usos hold the record for the most reigns with the SmackDown Tag Team Championships. The Miz and McMahon won the titles at the 2019 Royal Rumble pay-per-view by defeating Sheamus & Cesaro. The team held the championships for 21 days before losing to The Usos - setting the record for the shortest reign with the belts. Jimmy & Jey already set the record for the longest reign as SmackDown Tag Team Champions, but their victory at the Elimination Chamber gives them four reigns overall - surpassing their previous record that was tied with Kofi Kingston, Big E and Xavier Woods. The Usos and The New Day's rivalry in 2017 led to the team trading the titles back in forth for the majority of the year and their rivalry was regarded by many as one of the greatest feuds of on the main roster. The Usos were the first to set the record at three title reigns, but The New Day tied the record after defeating Erick Rowan and Luke Harper on the August 21, 2018 episode of SmackDown. The victory of The Usos comes off the heels of Jimmy being arrested for disorderly conduct and obstruction of justice this weekend, which caused many to speculate whether his arrest would influence the match's results. Despite losing their record to The Usos, The New Day still have the all-time longest reign with the Raw Tag Team Championships, which surpassed the title reign of the legendary tag team Demolition.